Wallpaper is a classic way to decorate your home partially or even in the place of paint. However, it has become more outdated as time has gone on. This has led to traditional wallpaper being redesigned and reinvented into textured wallpaper. Textured wallpaper offers unique designs much like traditional wallpaper does but with a raised, three-dimensional appearance (Source). This provides it visual depth oftentimes to mimic building materials like stucco, brick and tin. Depending on the choice you make for these wallpapers, they can give your home a variety of twists from adding elegance to your entryway all the way to adding a fun touch to your child’s bedroom (Source). No matter what you choose, though, textured wallpaper will offer you a unique novelty in your home. This wallpaper is applied much like regular wallpaper. However, where you apply it is up to you and your creativity. It can be painted or applied as is, allowing for a touch of novelty in your home. People who have bought these products were, generally, impressed. Many do suggest, though, that you order a sample before you commit to the full roll of wallpaper. This way, you can test the wallpaper against your wall to see if you like it before you install it completely. Some customers also noted that when you are painting some of these wallpapers, it is easy for the paint to clump or miss spots as you brush it on. To combat this problem, a few customers found that spray painting their wallpaper resolved this problem nicely. Today, we are going to look at five different options for your textured wallpaper. While these might be the same type of product, they are far from identical at the end of the day and it wouldn’t be fair if we weren’t honest about the comparisons of these products. The main way that these products compare to one another is in their patterns. Up first, the Blooming Wall textured wallpaper offers a simple look. After that, the Haok Home textured wallpaper gives us a faux brick wallpaper that is perfect for anyone looking for a distinctly modern twist on their home. The second HaokHome wallpaper on our list offers us a textured, vinyl design that most customers found to be perfect to decorate the wall behind their bed. Unfortunately, though, many customers complained that this wallpaper was less than they expected. 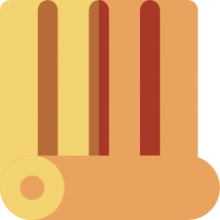 Several buyers specifically said that the product they received wasn’t as good as the product they were promised and what they got ended up looking cheaper than they expected. Lastly, the two Brewster textured wallpapers lean more towards more classic, Victorian-style designs. Both feature a theme that leans heavily on curves and circles in their designs. The Brewster 148-32817, though, has a much more subtle, less dramatically textured design than that of the Brewster RD80029. This faux grasscloth textured wallpaper offered by Blooming Wall is stylish, elegant, water-resistant, and an excellent choice for decorating your bedroom. Users love the color and the patterns, but some do note that it was difficult to apply it. The Blooming Wall textured wallpaper is vinyl coated and one large double roll measures 20.8in x 11 yards, which is great because you can cover up to 57 square ft with it. Moreover, this faux grasscloth wallpaper is washable, strippable, eco-friendly, and it has an antimicrobial protection which inhibits the growth of bacteria, stains, mold and mildew. However, be aware that you’ll need glue to apply the wallpaper. In general, users are extremely satisfied with the design and color of the Blooming Wall textured wallpaper, and they don’t have any major complaints. A reviewer comments that he found it very easy to apply the wallpaper and that he couldn’t be happier with it. He adds that it changed the look of this room for the better and that he highly recommends it. Another buyer states that the faux textured wallpaper seems durable and that it matches the provided description. A user also notes that she applied one roll of the wallpaper in one hour with the help of her husband and that her wall looks magnificent. However, one customer has said that the wallpaper he received had a different pattern than the provided picture. 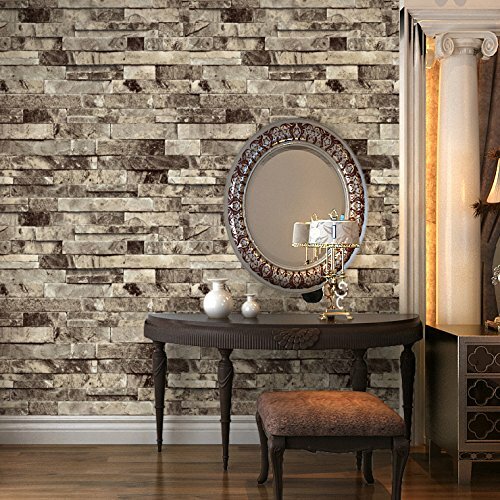 If you are searching for unique wallpaper for your living room, you might take a look at this faux brick stone textured wallpaper offered by Haok Home. Users love the pattern and the effect it creates, but some do note that it’s hard to apply it correctly. The Haok Home textured wallpaper measures 20.8in x 33 ft (one roll) with an approximate size of the bricks 7.8” x 2”. Another great thing about this wallpaper is that it’s waterproof, removable and available in four different colors/patterns. However, the manufacturer recommends that you buy enough rolls to decorate your room to avoid color mismatch. A reviewer comments that the Haok Home modern textured wallpaper looks great and that he has received many compliments for it. He also advises that you use the glue recommended by the manufacturer. Another buyer mentions that the 3D effect is unbelievable and that he highly recommends it to anyone looking for cheap textured wallpaper. He states that he didn’t have any issues applying, but warns that you have to be patient and careful. A user reports that it took him four hours to finish his fireplace wall and that the quality of the paper is excellent. However, some customers have said that the textured wallpaper didn’t look real enough for them and the image is fuzzy and blurry. Textured wallpaper can add a unique flair to your home. It can be used to cover imperfections on your walls better than a flat paint or wallpaper could. Using textured wallpaper is the same in any two homes and it allows you to creative as you remodel. 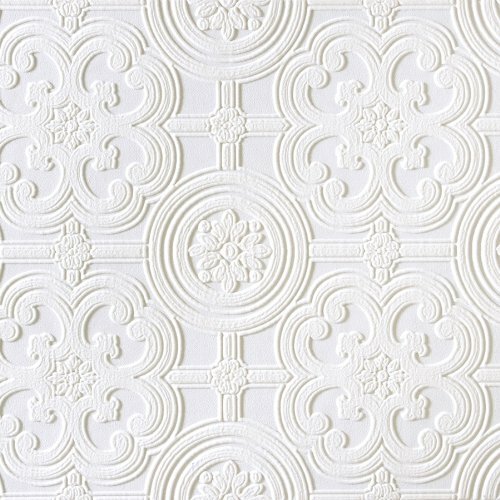 This paintable textured wallpaper offered by Brewster is elegant, beautiful and affordable. Users love the style, but some do note that the instructions are too generic. 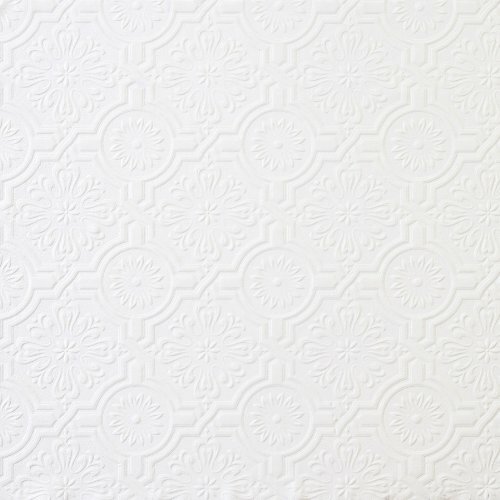 The Brewster textured ceiling wallpaper measures 20.5” x 395” so you can cover up to 50 useable sq ft with a “double roll” bolt (equals two continuous single rolls). Another great thing about this wallpaper is that it’s prepasted, which means that you don’t have to buy glue. What’s more, it’s washable, strippable and the patterns don’t repeat. Overall, this is an excellent choice if you want to create unique patterns and designs. In general, users have a favorable opinion of the Brewster paintable Victorian tin wallpaper, and they praise its style and elegance. A buyer comments that the wallpaper looks amazing after she painted it with silver nickel spray and that it’s perfect for her bathroom cabinet door. Another purchaser observes that the paintable textured wallpaper is easy to hang and paint. She also warns that you must handle the wallpaper carefully or it will tear. Nevertheless, she highly recommends it. However, some customers have said that the wallpaper adhesive doesn’t stick well and they recommended that you buy wallpaper glue if you plan to apply it to your wall. Some also note that they find the wallpaper difficult to trim. 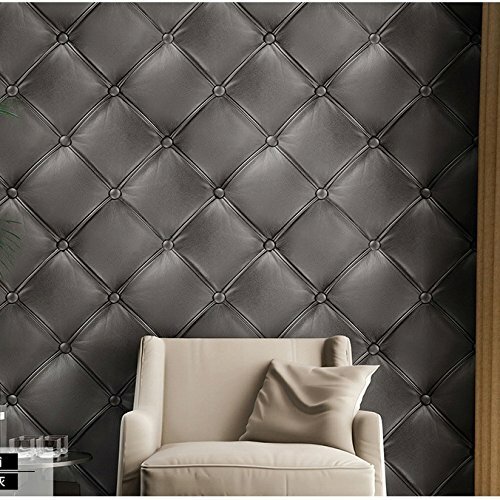 This 3D leather textured wallpaper offered by Haok Home is elegant, well-designed, and available in two colors – dark gray and vintage gold. Users love the quality of the paper, but some do note that it’s not as shiny as they expected. The Haok Home leather textured wallpaper measures 0.53 m x 10m (a roll), which is great because you can cover 57 square feet. Moreover, this 3D wallpaper is washable, strippable, waterproof and anti-bacterial, which means that you don’t have to worry about stains, mold or mildew. Also, instructions for application are provided with each roll. A reviewer observes that the Haok Home textured wallpaper looks magnificent in his home and that she couldn’t be happier with the result. She also states that you have to be careful when matching the shades. Another buyer comments that the color is accurate to the picture and that the quality of the paper is exceptional. She highly recommends it as the best textured wallpaper available. A user also notes that she didn’t have issues hanging up the wallpaper and that it’s perfect for DIY fans. However, some customers have said that textured wallpaper doesn’t look anything like the provided pictures and that it’s cheaply made. If you are looking for paintable textured wallpaper, you might consider this anaglypta wallpaper offered by Brewster. Users love the design and the quality of the paper, but some do note that they find it difficult to trim. The Brewster paintable wallpaper measures 21”x 396”, and you can cover around 57.75 square feet. It’s printed on expanded vinyl, and it has a half-drop match and 25.25-inch repeat. Another great thing about this product is that it’s washable and strippable, and you can use silk or matt emulsion paint with it. 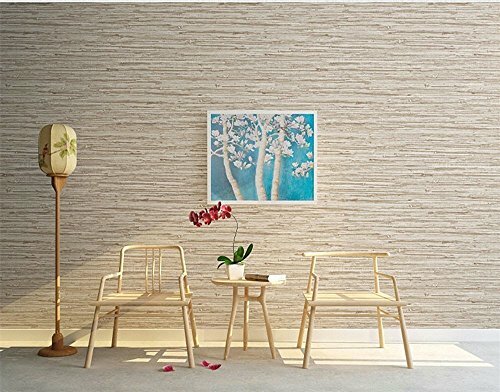 As a whole, purchasers are very impressed with the quality and design of the Brewster printable textured wallpaper, and they don’t have any major complaints. A customer observes that the paper is heavy-duty and easy to apply. But she warns that the wallpaper stretches when the glue is wet and then shrinks so you have to be careful when aligning it. Another online reviewer states that the wallpaper is easy to paint with chalk paint and that she highly recommends it as the best paintable textured wallpaper. A user also notes that she used it as a backsplash and that it looks perfect. The reviewer also notes that the wallpaper sticks well to the wall. When it comes to selecting textured wallpaper whether it be brick, stucco, plaster or paintable, many buyers defer to Sherwin-Williams or Home Depot for a three-dimensional option that photo-simulates a rough textured surface. Indeed, if you are looking for inspiration, you can head over to Pinterest, type in "textured wallpaper" and discover some innovative design options. We liked a wallpapered ceiling concept as well as grass cloth wallpaper wainscoting. Another savvy home decorator wallpapered a dresser and then painted it for a chic, oriental look. There are DIY wallpapered headboards as well as faux tin back splashes and even stairs that have been applied white ornamental textured wallpapers.